Simple stranded colorwork with a modern graphic design, Bubble Tea combines traditional fit with fun contemporary visual style. For the samples, I used a combination of bold and neutral colors, suitable for both men and women; color choices are endless, allowing you to select the perfect match of colors for the wearer. Bubble Tea is one of a bundle of modern stranded hats featuring strong motifs for fresh style, and is pictured with some of the companion designs. Size: 20” brim circumference and 9” tall, unstretched. 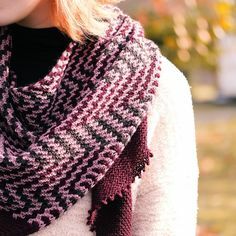 The pattern consists of a 24 st and 36 row repeat, and accommodates heads from 20-23” in circumference; to adjust the size further, go up or down a needle size. Yarn: Blue Sky Fibers Woolstok Worsted (100% fine highland wool; 123 yards/112m/50g), Cascade 220 Heathers (100% peruvian highland wool; 220 yards/200m/100g). Grey hat shown in Woolstok 1304 Grey Harbor (A) and 1317 Midnight Sea (B), red hat shown in Cascade 9488 Christmas Red (A) and Woolstok 1314 Deep Velvet (B); 1 skein of each color, or approximately 120 yards A and 60 yards B of worsted weight wool yarn. Other Materials: US 8 (5mm) 16” circular needle and dpns, or 32” circular needle if using Magic Loop, or size to match gauge; Stitch markers (4); Yarn needle. Gauge: 19 st and 24 rows/4” in stranded pattern, unstretched after blocking; 1 repeat of 24 st and 36 rows is 5” wide and 6.5” tall. Simple stranded colorwork with a modern graphic design, Down Arrows combines traditional technique with contemporary visual style. For the samples, I used a combination of bold and neutral colors, suitable for both men and women; color choices are endless, allowing you to select the perfect match of colors for the wearer. Down Arrows is one of a bundle of modern stranded hats featuring strong motifs for fresh style, and is pictured with some of the companion designs. Size: 20” brim circumference and 9” tall, unstretched. The pattern consists of a 24 st and 18 row repeat, and accommodates heads from 20-23” in circumference; to adjust the size further, go up or down a needle size. 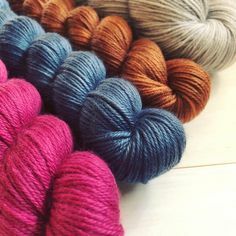 Yarn: Stonehedge Fiber Mill Shepherd’s Wool Worsted (100% merino wool; 250 yards/229m/113g), Patons Wool Worsted (100% wool; 210 yards/192m/100g). Brown hat shown in Stonehedge Midnight Lake (A) and Lilac (B), purple hat shown in Stonehedge Lilac (A) and Patons Plum Heather (B); 1 skein of each color, or approximately 110 yards A and 95 yards B of worsted weight wool yarn. Gauge: 19 st and 24 rows/4” in stranded pattern, unstretched after blocking; 1 repeat of 24 st and 18 rows is 5” wide and 3” tall. When there’s a little chill in the air but you don’t want to wear a coat, reach for Telos, a cozy coat-style cardigan. Practical warmth and knitterly interest meet, in a boxy silhouette with a heavily textured reversible alternating check patterned body and stockinette sleeves. The oversized shawl collar is worked seamlessly along with the body; the reversible stitch pattern allows it to be worn folded back or overlapped for more warmth. Dropped shoulders and wide ribbing at the hem and cuffs enhance the relaxed style, and hidden pockets in the bottom ribbing are there when your fingers get chilly. Techniques & Skills Used: cable CO, provisional CO, backwards loop CO, knit/purl, short rows, picking up stitches, increasing/decreasing. Size: 34 (40, 46, 52, 58)” bust; sample shown in third size worn with 11” positive ease. This boxy cardigan is designed to be worn with plenty of positive ease. I chose a very roomy fit for myself; the sample is shown in the third size worn with 11” of positive ease; choose a size that provides the amount of ease you prefer. Yarn: The Periwinkle Sheep INTENT (100% superwash merino wool; 185 yards/170m/100g), shown in Sandstorm; 6 (7, 8, 8, 9) skeins or approximately 1000 (1150, 1300, 1450, 1650) yards heavy worsted weight yarn. Other Materials: US 8 (5mm) 32” circular needle or size to match gauge, US 7 (4.5mm) needle for pocket lining; Scrap yarn for provisional CO; Stitch markers (6); Stitch holders (2); Yarn needle. Gauge: 16 st and 22 rows/4” in Check stitch, after blocking.